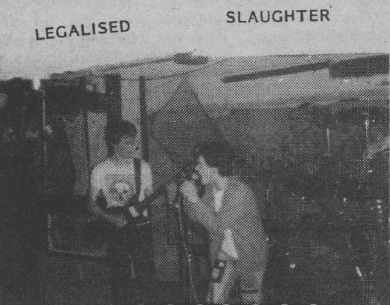 Crass Records style anarcho punk band from Dundalk who were mentioned in the Irish scene report published in Maximum Rock & Roll #12 (March 1984). They played on the bill of the "Let's Get Serious 2" punk festival held at the TV Club on the 30 September 1983 which featured the cream of Ireland's punk bands at the time plus headliner Conflict. The band released a tape on the Psycho-Fiction label (UK). Titles: "Mutant", "Corruption In Ireland", "Legalised Slaughter".